If you were excited to learn that the 6-quart version of Amazon’s most popular Instant Pot got a $20 discount, you’re definitely going to love the new deal that just went live on Amazon today. 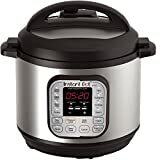 The even larger Instant Pot DUO80 8 Quart 7-in-1 Multi- Use Programmable Pressure Cooker just got a huge $50 discount, dropping it to its lowest price since Prime Day back in July. This is the biggest version of Instant Pot’s most popular cooker, with enough capacity to feed families of six or more people. Or if you have a smaller family, one recipe will feed you for days so you don’t have to worry about cooking again.